It is not uncommon for artists to rework or even reuse canvases. Careful examination with scientific techniques can offer glimpses of pasts images buried beneath the surface. But sometimes you don’t need sophisticated instruments; sometimes the underlying image is very obvious looking at the final piece. 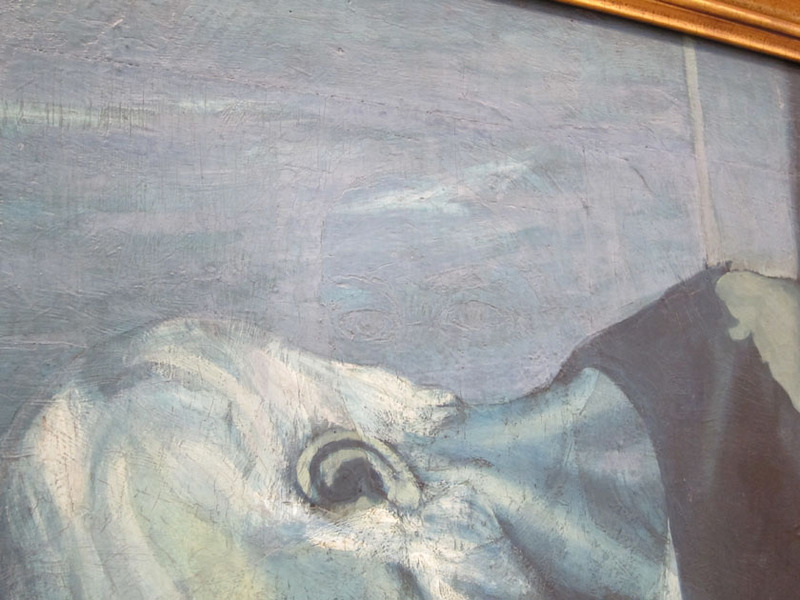 This was my experience with Pablo Picasso’s “The Old Guitarist” and the ghostly woman’s face in the top center of the painting. Looking at it from the side and letting the light graze the image, you can see the depth of her face very clearly. Walking through the ruins of the Acropolis and looking over the plaster copies of the Parthenon Frieze this last fall, I tried to put it all back together visually. Thankfully there were digital reconstructions to look to, but I got to wondering if wholesale reconstruction of a work of art is even possible. In most cases, pieces can be broken or destroyed and critical details of the overall assembly can be lost. (It’s a tangential example but I’m thinking of all the miss-assembled Victorian dinosaur skeletons.) Then I remembered Duccio’s Maestà in Siena. 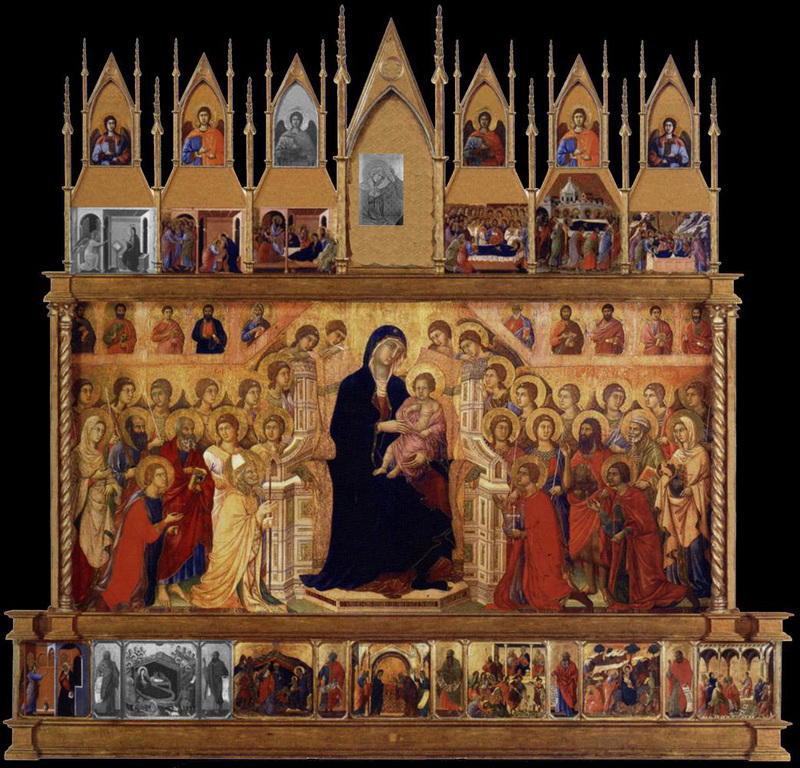 Duccio’s expansive Maestà Altarpiece was installed in the Siena Cathedral on June 9, 1311. The double sided piece is estimated to have been 4.7 by 5 meters in dimension. It was composed of a central panel (The Virgin and Christ Enthroned with Saints and Angels) and over 70 smaller scenes depicting New Testament iconography. Sadly this grand style of altarpiece went out of fashion and in 1711, the panels were dismantled, sawed apart, and dispersed. Most of the pieces are now back in Siena. Careful scholarship, analysis, and restoration has shed light on its original construction and composition. The Maestà altarpiece is not displayed in its reconstructed state which allows for better viewing of the visually rich story panels. These were likely executed by Duccio’s workshop but are all interesting. The central Virgin and Child panel alone is incredibly impressive. I remember seeing it at the Museo dell’Opera del Duomo in Siena. The room was fairly dark with a few spotlights on the panel which made the gilding glow. On the front of the altarpiece would have been a Marian cycle in the pinnacles and the birth and childhood of Jesus in the lower predella. 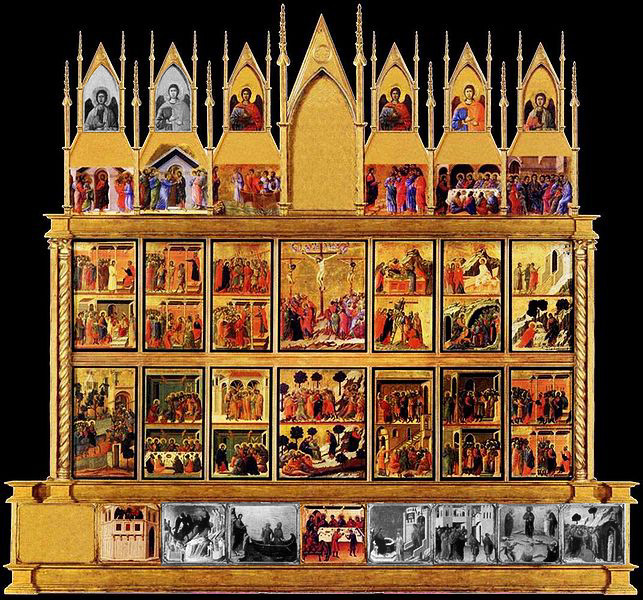 The reverse panel depicts the Passion sequence in the main section and scenes from the ministry of Christ along the pinnacles and predella. 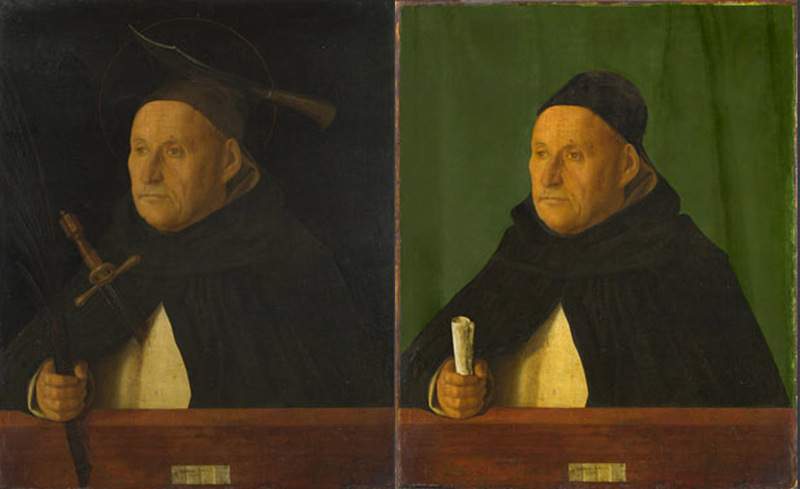 In the reconstruction images above and below, panels not presently in Siena are shown in black and white (missing panels are not shown). You have to actually go to Washington DC and Madrid respectively to see two of my favorites: the Nativity with Isaiah and Ezekiel and Christ and the Samaritan Woman. It is also possible to appreciate how pieces may have been shaved and shaped since being freed from the altarpiece frame. I have also accepted the interpretation that a piece showing the coronation of the Virgin now in Hungry was featured in the central front panel pinnacle. This makes sense thematically in the context of the smaller pinnacle images showing the life of Mary and would be appropriate subject matter for the period and location. The reconstructions also assumes that the pinnacle angels mirrored each other since only 4 of the 12 total exist today. Viewed as a whole, the complexity and ambitiousness of the project is evident. Whether or not the framing decorative elements are exactly correct is a moot point given the wealth of visual story-telling and the fairly confident reconstitution of the narrative flow. It’s amazing that almost all of the panels have survived. The Maestà demonstrates that reconstruction, at least digitally, goes a long way in understanding the artist’s intentions, the work’s visual impact, and how contemporary viewers would have encountered the piece. Reconstructions adapted from the Web Gallery of Art. Reference: Siena, Florence and Padua: Art Society and Religion 1280-1400, Volume II: Case Studies, edited by Diana Norman, 1995.